With the Mantis you have a better outdoor experience! ♦ Protect yourself and your family from the harmful affects of the elements. Reduce UV and Heat Exposure. ♦ Pursue your outdoor experience with greater comfort. ♦ Stay dry and cool. ♦ Don't let annoying, unpleasant conditions dissuade or distract you from enjoying the outdoors. ♦ Concentrate on your fishing (or other outdoor activity), not on the weather. ♦ Don't let the weather change or cancel your plans. ♦ Stay out longer or go out under more extreme conditions. ♦ Rain or shine, Mantis' unique design gives you the cover you need without interfering with your fishing or other outdoor activity. ♦ Use your Mantis only when and where you want. ♦ When not in use, the Mantis stores compactly. ♦ Quickly deploy when the weather turns hostile or uncomfortable. ♦ Easily move your Mantis to various positions within your boat. Use your Mantis on multple boats or other applications. ♦ Use it in a variety of outdoor environments including campsites, docks, decks, patios, picnic and pool areas, and outdoor events or on your riding lawn mower, tractor, scooter, wheelchair or ATV. ♦ User friendly features make Mantis quick and easy to use. ♦ Designed by those who know and love the outdoors for other outdoor enthusiasts. ♦ A great value relative to many umbrellas and traditional boat tops. 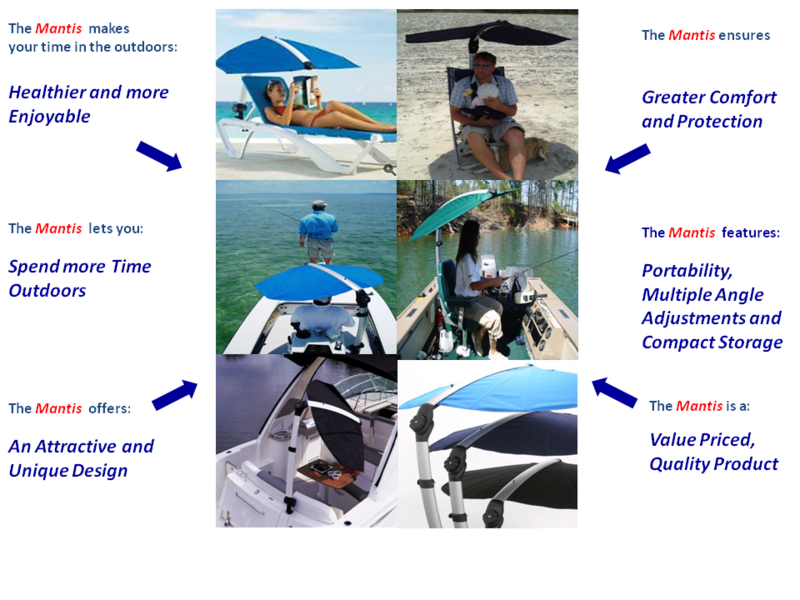 ♦ Quality components (aluminum frame, stainless steel hardward, weather resistant fabrics, UV resistant Nylyon 6 plastic) and assembly ensure years of use. ♦ Now with PayPal's Bill Me Later option, you can purchase your Mantis today and pay it off over six months. See: Buy Now, Pay Later. ♦ Purchase with confidence backed by Pro-Techt's commitment to you with our money back guarantee. See: Moneyback Guarantee. ♦ A great gift for the sportsperson in your life.